After 82 days docked to the International Space Station, a Russian Progress resupply freighter pulled away Monday afternoon to fly independently into a higher orbit for deployment of a science satellite and setting the stage for another cargo ship launching to the outpost later this week. The Progress M-13M spacecraft reached the station Nov. 2 to deliver three tons of equipment, food, rocket fuel, air and water. It was marked resumption of the Russian-provided supply chain after the August launch failure of the previous ship. 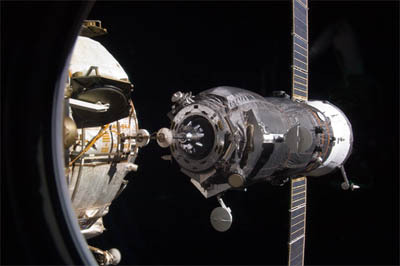 On Monday at 5:10 p.m. EST (2210 GMT) as the outpost crossed into an orbital sunrise 252 miles above the Chinese-Russian border, the 24-foot-long craft released from the Pirs module. A brief thruster firing by the Progress moments later accelerated its departure rate. The freighters engines will execute a pair of posigrade burns later tonight at 8:35 and 9:22 p.m. EST. The first will boost the craft by 77.7 mph and the second by 58.7 mph to propel the craft into an orbit more than 60 miles higher than the station. From its new altitude, the Progress on Tuesday around 6:19 p.m. EST will eject the Chibis-M microsatellite designed to study plasma waves in the ionosphere and the physical processes behind terrestrial gamma-ray flashes that generate in the vicinity of lightning in thunderstorms. Once the deployment is accomplished, the mission for Progress 45P will draw to conclusion. Its deorbital braking maneuver for disposal into the South Pacific ignites Tuesday at 9:25 p.m. EST, lasting for 3 minutes and 56 seconds, slowing the craft by 280 mph to put its trajectory into the atmosphere to burn up. The craft, now filled with trash and disposables from the station, will hit the upper fringes of the atmosphere at 10:04 p.m. and should break up around 10:11 p.m. EST. Any surviving pieces will splash harmlessly into the open ocean around 10:17 p.m. EST to conclude the 86-day, 17-hour voyage that began with a launch atop a Soyuz booster from Baikonur Cosmodrome in Kazakhstan. The next Progress, known in sequence as M-14M, is scheduled for rollout to its launch pad early Tuesday in preparation for blastoff Wednesday at 6:06 p.m. EST. Docking to the Pirs module is planned for Friday at 7:08 p.m. EST.